A team filled with the best players in the league who communicates poorly will flounder in mediocrity, while a team filled with run-of-the-mill players who communicates flawlessly will be contenders every year. Effective communication in sports is an absolute essential trait that quality teams must have to be successful, from the coaches, to team leaders, all the way down to the role players. Everybody must be on the same page. Everyone has a unique personality type. This personality type can be identified by taking a Myers-Briggs personality test, which was developed based on theories put forth by Carl Jung in his 1921 book "Psychological Types." One player may naturally feel motivated after a disciplinary action, while another may naturally feel shunned and demotivated. Every individual on the team, regardless of their role, has to be understood on a motivational level, and all communication from there on must be based on their personality type. A quarterback may need to communicate differently to each of the 10 people on his offense. Off the field is when players and teams get better, not on an execution level, but on a camaraderie level. Often, it's in the locker room that you learn the most about your teammates. Talking about past experiences, things you like to do during downtime and family history can help you understand that person better. That way, you know what things to say, and what not to say, when trying to motivate them on the field. Many professional players have problems retiring, not because they miss playing the game on the field, but because they miss the time spent with their teammates between games. Unlike off the field communication, effective communication on the field varies considerably from sport to sport. For example, in football there is constant communication going on. From coaches calling plays into the players on the field, to players making adjustments and calling out blocking schemes; however, in baseball communication is minimal at best. In fact, most players on the field are acting purely on their training and instinct after the bat makes contact with the ball. According to the Association for Applied Sport Psychology, 70 percent of human communication is non-verbal. In some sports, this number is even higher. Many times hand signals and a series of signs are used to indicate what a player is supposed to do on the field. 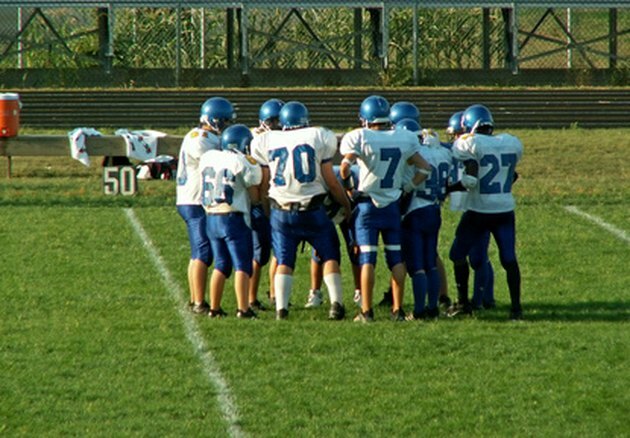 Thus, making sure that every player has memorized every possible signal, and ensuring that the signals are complicated and varied enough so that other team can't pick up on them easily, are extremely important aspects to effectively communicating during sports. Great teams are not formed overnight. Sometimes it takes years of players molding together to form a solid bond of communication, verbal and non-verbal, before the team can communicate and execute seamlessly on the field. To help expedite the process, coaches often arrange for a portion of every practice to be solely dedicated to communication. For example, in football it's standard for practice to include positional breakouts in practice, allowing quarterbacks and receivers to practice hot routes and audibles together with and without words. Why Does One Volleyball Player Wear a Different Jersey?